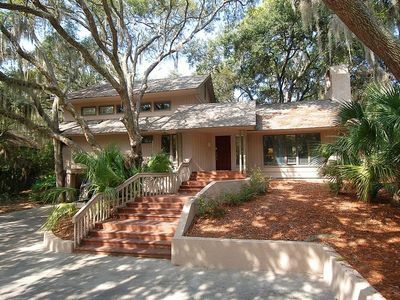 Sea Pines - Oceanside, Luxury, 4 Br En-Suites, Private Pool, Largest Beaches! 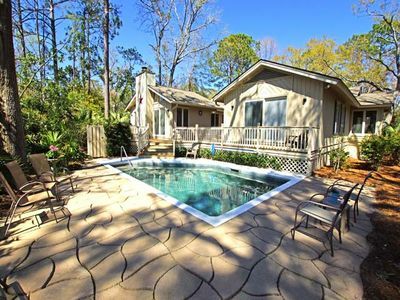 2 Cedar Wax Wing is a Sea Pines Hilton Head 4 bedroom with private baths home near the South Beach area. 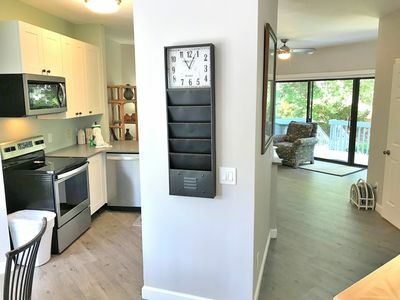 This single level home is very spacious with two living areas and a beautiful kitchen with granite counter tops, stainless steel appliances and updated, cabinets. 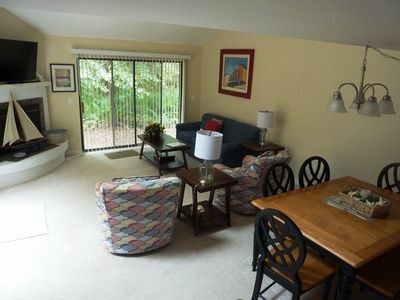 There is an easy flow from the kitchen to the dining area and the two living rooms. 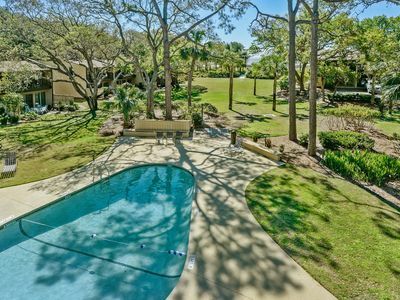 As you walk up to the home, the inviting, private pool is at the front of the house. 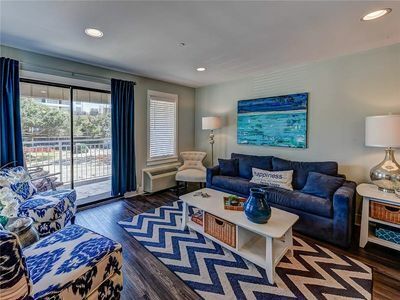 Upon entering the front door there is a casual living room on the left side with a large, sectional sofa. 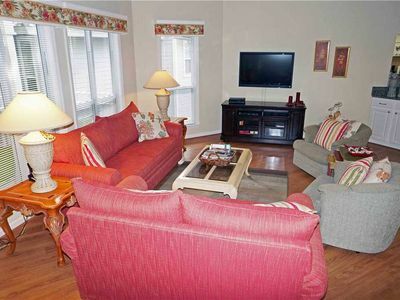 To the right of the front door is another living room, the dining room and kitchen. 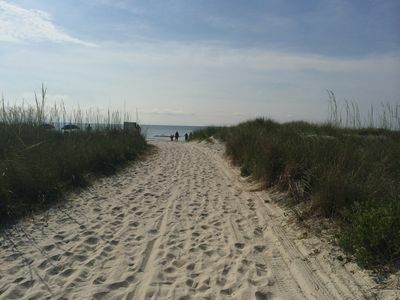 Two small decks can be found off of this area where you can relax after a day at the beach. The dining area has a huge wooden table with enough seating for 12 - 14. 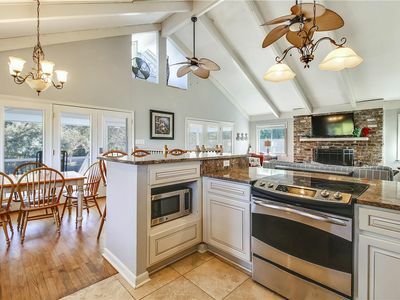 Guests will enjoy the large, open kitchen with tons of counter top space. 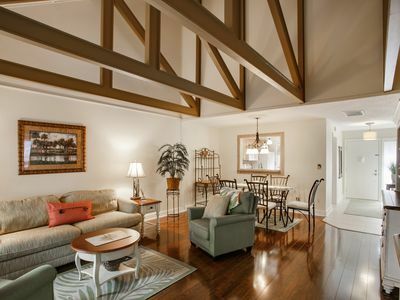 This open living and dining area has beautiful vaulted ceilings with wood beams. 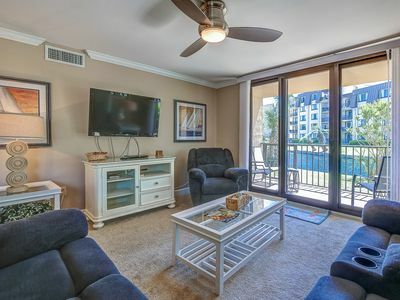 The living room also features a 50 inch flat panel TV as well as a sleeper sofa for additional guests. 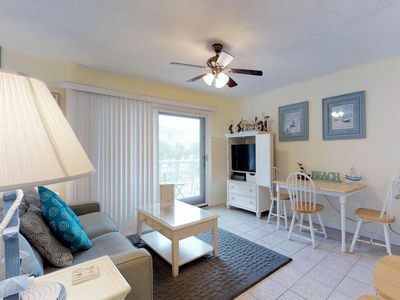 Off of the living area is a bedroom with a king size bed and a trundle bed with 2 twins. 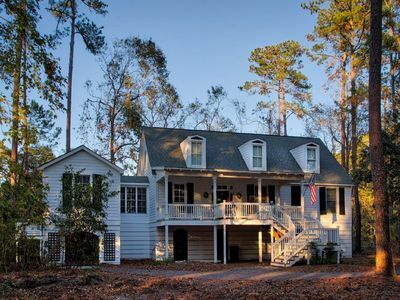 It has a private bath with double sinks, a separate shower and large whirlpool tub. This bedroom also has access to the front pool area. 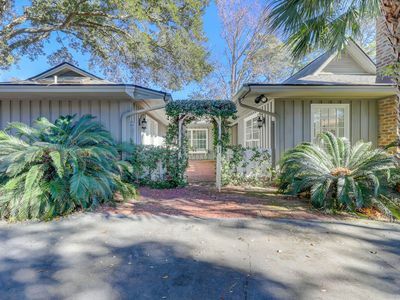 On the other side of the house, past the second living room, are the three other bedrooms. The first bedroom has a king size bed, a trundle bed with 2 twins and a French door leading to a small deck. It also has a private bath with a shower. The second bedroom also has a king size bed with a private bath with separate shower. The third bedroom has a king size bed with a door to a small deck. It has a private bath with the standard tub/shower combination. 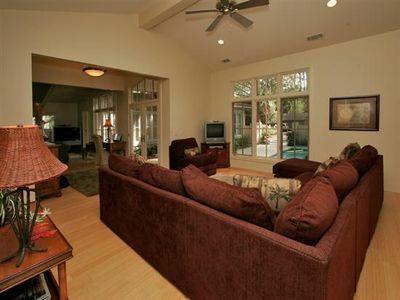 Additionally, there is a half bath off of the living area. 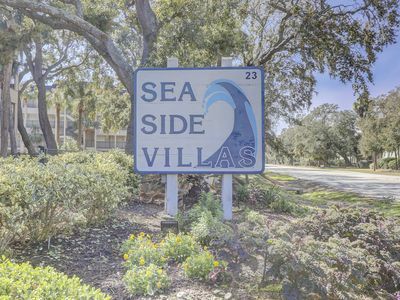 This charming 5th row ocean home is a mere 2 or 3 minute walk to the beach. 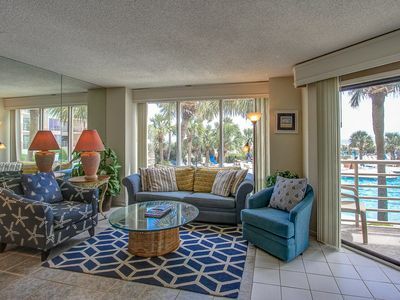 It is the perfect home for a family vacation with its open floor plan and the spacious living areas. 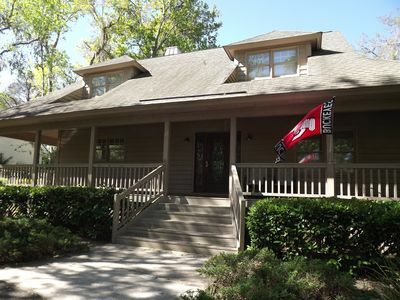 Hilton Head, Sc 3 BR Home - 3 Ginger Beer Ct.
A lovely home with expansive porches, overlooking Lake Best. Relax, Recharge! 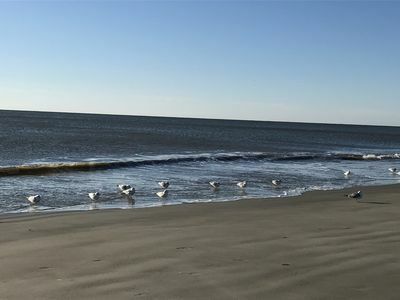 Completely Remodeled Close to the Beach Townhouse - Minutes from Coligny Plaza! 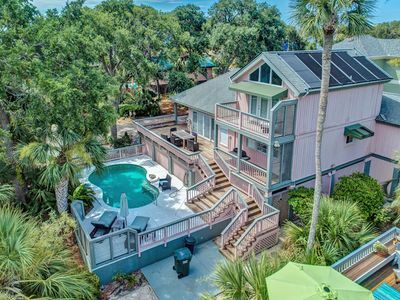 Relaxing villa w/ ocean views, shared pool & balcony - walk to the beach! 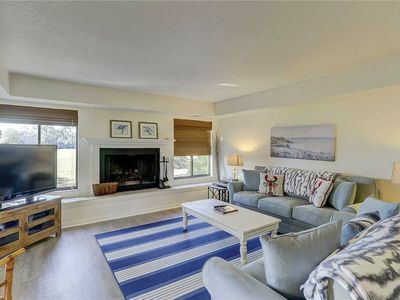 Ocean Dunes 201 - Beautifully Redone Villa with Great Ocean View.